NEMS Linux is a modern pre-configured, customized and ready-to-deploy Nagios Core image designed to run on low-cost micro computers such as Raspberry Pi and PINE64 single board computers. At its core NEMS is a lightweight Debian Buster deployment optimized for performance, reliability and ease of use. 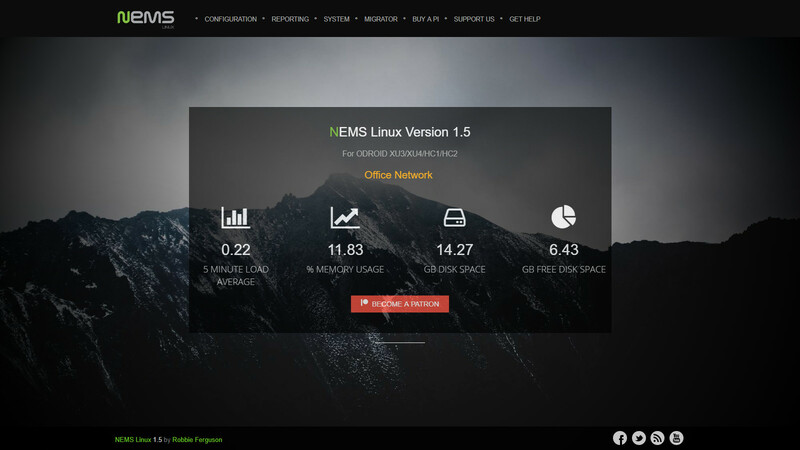 NEMS Linux is free to download, deploy, and use. Its development however is supported by its community of users. Please consider contributing if you can. With an active Discord server, community forum, semi-annual releases and regular updates, NEMS is an active and current project with a vibrant and growing community. There is no cost to download and use NEMS Linux, and the source code is available on GitHub. I know you're over-worked as it is, so I've done all the hard work to get you up and running fast. NEMS Linux offers both an on-premise and secure off-site backup solutions to protect your configuration in event of hardware failure. The goal with NEMS Linux is to provide a free, full-featured, up to date drop in Nagios Enterprise Monitoring Server for Raspberry Pi 3 and other SBCs. It has all the bells and whistles while being optimized for solid stability and fast performance. The original NEMS Linux release was based (with big thanks to Ryan Siegel) on NagiosPi, with many of the settings reflective of the NagiosPi Wheezy distro. Here is what Ryan Siegel, the creator of NagiosPi has to say about NEMS Linux: "I'd love to upgrade NagiosPi, but I don’t have the ability to make a GUI that can beat that of NEMS. I strongly feel that it has always been a necessary addition to NagiosPi and NEMS was able to deliver what is essentially an updated and improved version of NagiosPi. No reason not to start using NEMS for the time being. Nice work Robbie!" NEMS Linux has since become a popular drop-in Nagios distro for the Raspberry Pi and other SBCs, with a major release at least once per year. I am Robbie Ferguson — also known as "Bald Nerd" — and I am the developer responsible for building and maintaining NEMS Linux. I am the host and founder of Category5 Technology TV, a popular webcast that has been on-air since 2007. I am a lover of Linux and open source, and an advocate of freedom, respect and equality among all people. Thank you for checking out NEMS Linux, my little "labor of love". NEMS Linux is on the Nagios Exchange—the officially-endorsed Nagios Enterprises community web index. Nagios doesn't need a big fancy supercomputer to offer exceptional enterprise monitoring of network assets and resources, so our temptation is to re-purpose older servers to perform this reasonably lightweight task. If you ask me, that’s not only overkill, but the attempt to save money by reusing older hardware will actually cost more due to higher electricity usage vs. say, a tiny Raspberry Pi 3 Microcomputer... which ironically may in fact have more modern system specifications than that old beast of a server you've been using. It can be a wee bit daunting to setup a Raspberry Pi Nagios server from scratch, and there were no projects I found which were actively maintained at a level adequate for professional use. So I decided to start a new project–called NEMS: Nagios Enterprise Monitoring Server. This project uses freely available applications such as Debian Linux, Nagios Core and a variety of other goodies, and I too release a fully ready-to-use image for you to use within yours or your customers' network environments.